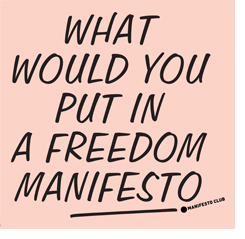 28 April Clubnight: What would you put in a Freedom Manifesto? Old political issues, from the economy to foreign policy, have lost their fire: these are no longer the trenches that divide political life. – freedom from the overwhelming power of the state – CCTV cameras, ID cards, detention without trial. We have invited activists from different points on the political spectrum to discuss the challenges for freedom today – and to suggest what they would put in their Freedom Manifesto. Do we need a new freedom alliance? Speakers: Guy Herbert (No2ID), Henry Porter (Observer columnist and civil liberties campaigner), James Panton (Manifesto Club), Alex Deane (Big Brother Watch), Rowenna Davis (features writer, The Guardian).